"Talent you have naturally. Skill is only developed by hours and hours of beating on your craft." 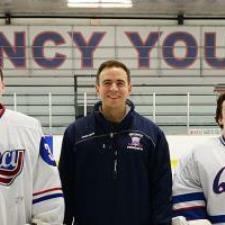 My name is Erick K.; I am a local High School History Teacher and Hockey Coach. To me coaching and teaching are one and the same. I like to bring a coaching approach to my teaching. Too often we place self-limiting beliefs upon ourselves. As a kid growing up who was vulnerable to "fall through the cracks" and a late-bloomer, I believe that learning can be joyous for us when they learn to embrace the journey. Too often people are told that they can't fail, when in fact becoming comfortable with failure, and learning from failure will sharpen our skills more than our successes. Consider me your guide through this process. In addition to social studies, I have a background in public speaking as a graduate of Dale Carnegie Training, and am currently a coaching certification director for USA Hockey. Public speaking is much easier than we think; we just have to get out of own way. I'll show you how! As someone who has changed careers from recruiting, to finance, to teaching, I've walked the walk. When pursuing our passions it's important to have a base to operate from and to ask ourselves if our skills are truly portable, or are we confined to a space. In examining someone's career I will help you figure out your 'why.' If your 'why' is strong you can almost guarantee your success. Goals are one thing, but are you willing to embrace the process and drudgery that can be involved with getting there? Working in, and being exposed to many different environments through work and leisure has taught me much. My experiences have taught me how to remain calm in tense circumstances, to connect with people of all backgrounds, and to sharpen my antennae for how and where people fit in the world. The greatest quest in life is to reach one’s potential and I want to teach kids how to embrace that journey. Teaching social studies is more than just timelines. We are talking about developing responsible citizens who can make thoughtful decisions that draw upon personal experience and logic. What better way to teach this than through social studies? Social Studies provides a wonderful journey of self-discovery by studying the decisions and behaviors of ordinary people then connecting them to the present. Rarely do historical figures set out to make history; it just happens. By looking at the decision-making process of historical figures, and their long-term repercussions, we can teach ourselves to make better decisions and discover what our own values are. Any sort of schooling experience can be a confusing time and I like to believe that I can help coach them through some of that confusion. If I'm not teaching, or coaching you may find me in the woods on a hike, surfing, in the gym, or my next adventure. Hope to hear from you soon! In addition to social studies, I have a background in public speaking as a graduate of Dale Carnegie Training, and am currently a coaching certification director for USA Hockey. Public speaking is much easier than we think; we just have to get out of own way. I'll show you how! As someone who has changed careers from recruiting, to finance, to teaching, I've walked the walk. When pursuing our passions it's important to have a base to operate from and to ask ourselves if our skills are truly portable, or are we confined to a space. In examining someone's career I will help you figure out your 'why.' If your 'why' is strong you can almost guarantee your success. Goals are one thing, but are you willing to embrace the process and drudgery that can be involved with getting there? I am a current High School History teacher, including American History.